Hidden Wisdom utilizes Dr. Lloyd Glauberman�s revolutionary HPP (Hypno- Peripheral Processing) method to remove unconscious blocks and allow new ideas to breakthrough into consciousness. These hypnotic audio CD�s work on numerous levels, which include building confidence, generating new ideas and motivating you to maximize your creative and artistic potential. Because your unconscious does the work, there are no journals to keep or tasks to do. Just sit back, put on the headphones and listen to the multiple storytelling format. The changes you experience will be spontaneous and fluid as you seamlessly integrate these new creative patterns into your life. No matter what type of creative inspiration you are looking for � in the arts, business or your personal life- Hidden Wisdom will set into motion a series of new ideas that will change the quality of your life in a very positive way. 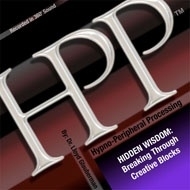 Unlock your creative potential with HPP and Hidden Wisdom. Thank YOU so much Dr. Glauberman!